Graceful filigree is deeply embossed on the front panels of this bright white gate-fold invitation. The panels open to reveal your wording printed inside. Seals shown are sold separately. Paper weight is 100 lb text. Inner and outer envelopes are included. I was really worried after reading the other reviews on this invitation that it was going to look and feel cheap, and the size was going to be disappointing. Honestly i'm so pleased with it! Is it heavy card stock, no, but is it nice paper? YES! The size is on the smaller side but not by much and when it is opened up it's not even an issue. We got the gold lined envelopes for a more dressy feel and we also got the matching RSVP cards. It is really beautiful and how can you beat the price? Shipping was fast as well and everything was in perfect condition upon arrival! VERY HAPPY!!! i waste my money here !!!!! too small this is not for wedding invitation !! the quality so bad !! don't order this !!!!!! Beautiful Wedding Invitation Choice and Fantastic Quality! I absolutely loved this wedding invitation! From the moment I saw it online on Ann's Bridal Bargains I knew this was the best fit for my wedding theme - vintage chic. The quality is amazing! Very classic and elegant. Writing the invitation text was a simple process using the templates provided, which could also be customized. Choosing the fonts was also simple, as the website provides you with great options. Payment was fast, easy and secure. The invitations were delivered to me in about a week and were well packaged. No errors. No complaints whatsoever. I highly recommend this particular invitation and very much recommend using Ann's Bridal Bargains...it is a trustworthy website. We ordered these invitation with our choice of ink and lined envelopes. The product looked really good and classy. It was as advertised and expected. The price was also very good. We will definitely come back here if we need invitations in the future. The product was delivered on time and was packed pretty well. No damage to any of the invites, cards, or envelopes. I really liked that there were so many options when selecting how I wanted these invitations to look. I was able to find my color of choice for the writing and it was very helpful that a template was in place for the wording. 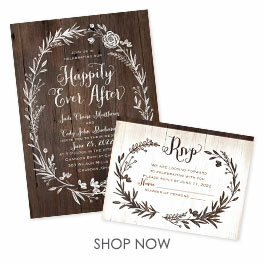 The invitations are perfect for my wedding and VERY affordable when compared to other invitation companies. Anns made it very simple when ordering and designing these invitations. I also ordered on Monday and received them by Wednesday...SUPER awesome delivery! They look great and the preview is very similar to what you get. If you are looking for affordable but good quality invitations without going over the top I would definitely recommend Anns Bridal Bargains. Amazing! Shipped and delivered in three days with no rushed shipping. The discount codes were so helpful with cost, even though they were already amazingly priced. I also loved that they were packaged well. The product is exactly what it looked like online. I bought the main invitation as well as the additional information card. The additional information card is actually a card, not just a piece of paper. I love that they both match. Also, none of them were bent, or had anything wrong with them. They package them really really well so nothing happens during delivery. Delivery was exceptional! It was delivered about 4 days before it said it would be, which was great. Was suprised to see how great these really are for the price We had a small budget and these are simply beautiful. I was concerned about what the quality of "bargain" invitations would be but I am ECSTATIC with the purchase! These invitations are the perfect classic meets modern look I was going for. I placed a rectangular piece of deep purple tissue paper over the text, then the response card, then info card before folding and stuffing. I chose not to add a ribbon tie or sticker because I thought those things would take away from the gorgeous embossed design (and add weight which would add postage!) Beautiful! Our invitations are beautiful and cant believe how quick i got my order. Invitations were something we wanted to get at a good value but to look elegant and fit our winter theme. These were great and shipping was so fast. My daughter and her fiancee` just loved these invitations when they saw the on your site. She ordered a sample which was a perfect way to really 'see' and feel the paper and printing.This invitation and its reception/RSVP cards are light enough weight so that we didn't have to pay double for mailing them all out - which was an additional savings - Thanks Ann's Bridal we received much value for this product all around.It was available in lots of colored type, and we were able to put all the information we needed to without looking crowded.We ordered early just in case there were any delays or issues, but everything came as ordered and it was shipped and received within the 2 weeks.We loved that you addressed the RSVP envelopes for us and it was included in the price. It was also very helpful that we were able to view our exact invitation with our words/color ink, etc. online as we were creating them. We sent it back and forth to each other for double checking and opinions- easy to create what they wanted and let them 'see' it as it would print so there were no surprises.Can't say there's really anything not good about the product - I would have liked the invitation weight to be a tad heavier; but then the mailing wouldn't have been as great a deal too. The embossed design on the front is nice, but the size of the invitation is very small for a wedding. Also, the paper is extremely flimsy and does not lend itself to feel like a wedding invitation. The print came out well on the inside and the envelopes were nice. The size was way too small and I missed that when I ordered them. I had to order something totally different so I wasted money here. The invitation was beautiful - exactly had the romantic feel I was going for! The only dissapointment was the paper weight - I feel it was a bit flimsy.